For those who want to prepare yogurt in large batches, the VitaClay 2 in 1 Yogurt Maker may well be the one. It also comes with a slow cooker feature which makes it versatile. It is very convenient to use and extremely cost efficient. The main differentiator that VitaClay is the way it has been produced. While most of the other products are made up of plastic and metal, VitaClay provides a healthy chemical free option made of clay. Secondly it has a very good temperature control. It has several temperature settings, namely High, Low and the one us yogurt fanatics will be keen on, called um… Yogurt. It also provides the option to choose your own ingredients where you can ensure it can be low fat and free of additives and preservatives. Since it is a clay pot, it is renowned for its ability to retain the flavor and hold the nutrients together. It comes with an instruction manual and a recipe booklet. When you want to try different types of yogurt, the recipe booklet is really helpful as it provides a myriad of healthy and gourmet recipes which can be simply customized to your personal preferences, for a but of fun and for your health requirements. The unit has a well-designed heating base with three leg stand and has a power cord. The inside of the base is very broad which can accommodate good amount of yogurt. It comes with two handles on either sides which easy to carry. There is a separate clay pot that fits well into the base. It needs to be covered with a see through glass lid which also has a handle at the top. The size of the unit is 2 Quart/64 Ounces. While making yogurt through a slow cooker model, you can use any kind of milk and some plain yogurt or yogurt culture. I preferred the instant nonfat dry milk as it helped to make the yogurt thicker and smoother. 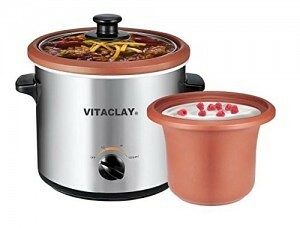 Using the VitaClay 2 in 1 Yogurt Maker and Slow Cooker in Clay, is one of the easiest way to make homemade yogurt. There is not much you need to do in the yogurt preparation. You just have to enjoy the wait and allow the yogurt maker to produce wonderful results that is worth waiting for. VitaClay 2 in 1 Yogurt Maker’s clay pot comes unglazed to provide the true benefits of cooking in clay to the user, the type of cooking we often see in the eastern countries utilize this. The removable clay pot and the glass lid is very neatly designed, handy, convenient to carry, store in the refrigerator and easy to clean. This unit can be of real use when you have to prepare significant amount of yogurt in less time for parties and occasions. The best thing you will like about this one is the clay insert that enhances flavor and texture. It is also best suited to make yogurt cheese and one of the all-time favorites, the ever-nutritious greek yogurt. The unique value proposition of this product lies in taking advantage of the centuries-old slow-cooking in organic clay pot with good temperature control that ultimately delivers a healthy nutritious and flavorful yogurt. This entry was posted in VitaClay, Yogurt Making and tagged Slow Cooker, VitaClay.